The campus of HCU is full of art and beauty. In the campus which is surrounded by the nature and in an open atmosphere, three buildings with a unique, creative design of the three Faculties are located in a radial form. The information network and Internet access with wireless LANs are available throughout the campus. The Library stores approximately 300,000 books, 470 journals, and 1,150 audio-visual resources, all of which are registered in the centralized searching system. The Language Center has the CALL (Computer Assisted Language Learning) system installed in all classrooms. The Student Study Room provides a comfortable environment for self-study, with approximately 4,600 audio-visual materials and journals for language learning. 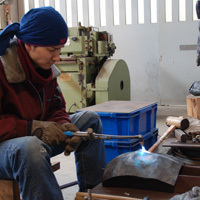 The Faculty of Arts has well-equipped studios of the largest scale in the country for various types of fine art such as sculpture of stone and metal, to offer an ideal environment for creative work.